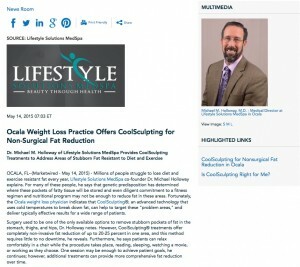 Dr. Michael M. Holloway of Lifestyle Solutions MedSpa provides CoolSculpting® treatments to address areas of stubborn fat resistant to diet and exercise. Ocala, FL—Millions of people struggle to lose diet and exercise resistant fat every year, Lifestyle Solutions MedSpa co-founder Dr. Michael Holloway explains. For many of these people, he says that genetic predisposition has determined where these pockets of fatty tissue will be stored and even diligent commitment to a fitness regimen and nutritional program may not be enough to reduce fat in these areas. Fortunately, the Ocala weight loss physician indicates that CoolSculpting®, an advanced technology that uses cold temperatures to break down fat, can help to target these “problem areas,” and deliver typically effective results for a wide range of patients. Surgery used to be one of the only available options to remove stubborn pockets of fat in the stomach, thighs, and hips, Dr. Holloway notes. However, CoolSculpting® treatments offer completely non-invasive fat reduction of up to 20-25 percent in one area, and this method requires little to no downtime, he reveals. Furthermore, he says patients can relax comfortably in a chair while the procedure takes place, reading, sleeping, watching a movie, or working as they choose. One session may be enough to achieve patient goals, he continues; however, additional treatments can provide more comprehensive fat reduction over time. Patients trying to determine if CoolSculpting® may be right for them should consider a few factors, Dr. Holloway states. He says that individuals should be close to or at their goal weight, as CoolSculpting® is not designed for weight loss but spot reduction. Additionally, he emphasizes that people should have reasonable expectations for results, and that they should discuss their needs and goals with the attending physician. Ultimately, Dr. Holloway believes that CoolSculpting® can be an excellent option for patients striving to reduce pockets of fat and enhance the contour of their body but who do not want to undergo an invasive procedure. If diet and exercise cannot achieve the desired outcome, he states, CoolSculpting® may be able to help. Lifestyle Solutions MedSpa was co-founded by Dr. Michael M. Holloway and Shannon Holloway with the goal of helping patients enhance their health and beauty through leading treatments and technology. The medical team, which includes weight loss physicians, lifestyle coaches, dieticians, and aestheticians, is dedicated to exceptional patient care. In addition to customized weight loss programs, the practice also offers facial and body rejuvenation procedures, including BOTOX® Cosmetic, laser skin resurfacing, and chemical peels. For more information about Lifestyle Solutions MedSpa, please visit lsmedspa.com.